Today the company is a subsidiary of American Axle & Manufacturing, and manufactures axles, driveline systems, chassis systems, crankshafts and chassis components. It is Scotland's best known name in the motor industry. Albions were renowned for their slogan "Sure as the Sunrise". 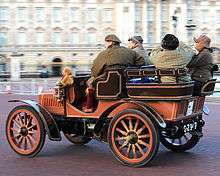 In 1900 they built their first motor car, a rustic-looking dogcart made of varnished wood and powered by a flat-twin 8hp engine with gear-change by "Patent Combination Clutches" and solid tyres. 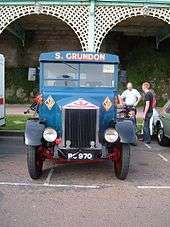 Trucks and buses (single and double deckers) were manufactured in the Scotstoun works until 1980 (1972 for complete vehicles). The buses were exported to Asia, East Africa, Australia, India and South Africa. Almost all Albion buses were given names beginning with "V", these models being the Victor, Valiant, Viking, Valkyrie, and Venturer. Albion also made the Claymore with the 4 speed gearbox,The Reiver was a six wheeler. The Chieftain had a 6 speed gearbox,6th being an overdrive gear, with a worm and wheel rear axle. In 1923 the first dedicated bus chassis was announced derived from the one used on the 25 cwt truck but with better springing. Bodies seating from 12 to 23 passengers were available. A lower frame chassis, the Model 26, with 30/60 hp engine and wheelbases from 135 inches (3,400 mm) to 192 inches (4,900 mm) joined the range in 1925. All the early vehicles had been normal control, with the engine in front of the driver but in 1927 the first forward control with the engine alongside the driver was announced as the Viking allowing 32 seats to be fitted. Diesel engines, initially from Gardner, were available from 1933. The first double deck design was the Venturer of 1932 with up to 51 seats. The CX version of the chassis was launched in 1937 and on these the engine and gearbox were mounted together rather than joined by a separate drive shaft. 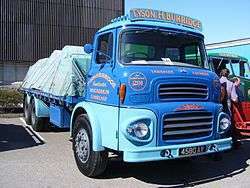 Albion's own range of diesel engines was also made available. Talisman TA (1959) 9.8 litre front engined 6x4 dirt-road bus. 5 built for Rhodesian Railways. Mark Knopfler's song, "Border Reiver", the first cut on his 2009 release, "Get Lucky", contains direct references "My Scotstoun lassie", "She's an Albion" and "Sure as the Sunrise"
1 2 Ware 2012, p. 193. Michael Sedgwick, "Albion", in G.N. Georgano, ed., The Complete Encyclopedia of Motorcars 1885-1968 (New York: E.P. Dutton and Co., 1974), pp. 32. Ware, P (2012). The illustrated guide to military vehicles. Wigston: Hermes House. ISBN 0-85723-953-8. Wikimedia Commons has media related to Albion Motors.